Apparently, the new Ghostbusters game is further along than we all thought. An official website is already up, complete with screenshots and other assorted game information. Children of the 1980s, prepare to have your minds blown. 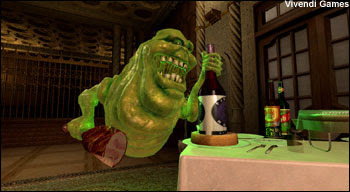 Published by Vivendi Games' Sierra Entertainment label, Ghostbusters: The Game will take place in the early 1990s and continue the storyline of the first two films. Variety confirms that the film's original cast will return to voice the characters, with supporting actors Rick Moranis, William Atherton, Brian Doyle Murray and Annie Potts also returning. The core version of the game will be released in the fourth quarter of 2008 for PlayStation 3, Xbox 360, and PC while a more family-oriented version will be made available for PlayStation 2, Nintendo Wii and the Nintendo DS. 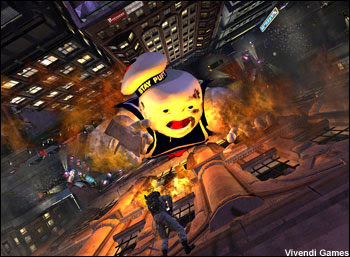 G4TV.com posted earlier this week some amazing gameplay footage that seems to recreate many key scenes from the first film, such as the New York Public Library ghost encounter, Slimer running amok in a swank Manhattan hotel and, of course, the climactic battle with The Stay Puft Marshmallow Man. It seems like the game will bring players up-to-speed on the Ghostbusters mythos before jumping into new material. Excited? You should be. This could be one of the all-time best movie-to-game translations we've seen, and Ghostbusters is a property with game franchise written all over it. So next fall, who you gonna call?